Rose’s quote speaks to a kind of cultural homelessness endured by Indigenous Peoples that is hard to quantify in current understandings of homelessness as outlined by the Canadian Observatory on Homelessness’s Canadian definition of homelessness: unsheltered, emergency sheltered, provisionally sheltered, and at risk of homelessness. This is because she is describing something that isn’t about being without a structure of habitation or brick and mortar home. Rose’s homelessness, rather, is about something much deeper: existing in the world without a meaningful sense of home or identity. Rose’s eventual unsheltered houselessness in adulthood, as she articulates, happened as a result of the cultural homelessness she endured since being placed in a “white” home at age 8. This traumatic childhood dislocation from her Sliammon people left her without Indigenous identity, language, kin, culture, and connection to her traditional lands. If we really listen to her words carefully, then, it is clear that, as Rose understands it, she became homeless in childhood—the houselessness she endured in adulthood was only a symptom of that earlier loss of Indigenous culture and kin. Metis Elder Joe “Eagle Eyes” Motuz describes a similar but different kind of dislocation—a disconnection from nature, Creator, and Indigenous spirituality. Joe, like Rose, was torn from his parents at a young age and raised in child welfare. He lived in a series of sexually and physically abusive homes growing up. The abuse was so severe that as a young man, Joe’s mind and spirit “buckled” and shattered and “culminated in a severe nervous breakdown” by the time he was 18. After being housed in a mental health institution for a few years, he was unceremoniously released onto the streets with no family, friends, or institutional support—he had aged out of child care and literally had nowhere to go. He learned quickly to depend on drugs and alcohol to numb his spirit—a poly addiction that persisted for almost two homeless decades. Only through help from mental health specialists and reconnecting with nature and Creator, according to Joe, did he recover, sober up, and stay off the streets. Joe’s story reads, “[I]n 1990… [I] underwent an intense period of introspective learning whereby [I] accepted the idea of a higher power/Creator, understood the power of healing, began to appreciate the power of prayer and incorporated the importance of sharing into [my] life. [I] also credit the Canadian Mental Health Association as a secret to [my] transition from homeless addict to housed citizen. Nature, the Creator and service to [my] fellow street family keep [me] vibrant and alive.” (Homelessness is Only One Piece of My Puzzle, 76). Joe’s homelessness, as with many residential school survivors I’ve spoken with, was really about a total disconnection and destruction of spirit brought to bear by harmful colonial institutions that tried, and failed, to make them into assimilated Canadian citizens. Here again we see that Joe’s experience digs much deeper than simply having nowhere to live. To him and other Indigenous Peoples, their homelessness began when they lost an Indigenous cosmology and sense of belonging within an Indigenous community. The later houselessness that spawn from this disconnection would not have happened, I theorize, if they had been spiritually grounded since childhood. Further, the dislocation of “spirit” also creates within those who suffer its terrible affects, an imbalance of healthy mental faculties, which later manifests into readable psychological disorders from repeated bouts of trauma, racism, and exclusion. These leave sufferers feeling like they don’t belong anywhere, or can’t navigate society, feeling like they never have the right conditions to survive, or have a mind wracked by traumatic memories, and are never centered and confident in their daily lives. To Joe and others like him, then, their homelessness was also about mental imbalance, loss of kin, no meaningful connection to land, and having nowhere to go after aging out of the “system.” It’s not, according to Joe, simply about being unhoused. Cree Althea Guiboche (the Bannock Lady of Winnipeg), is the pride of her community and of many Indigenous Nations. She goes out weekly with her organization Got Bannock and feeds Winnipeg’s homeless population. She and her “Bannock Army” whip up thousands of sandwiches, soups, juice boxes, fruits and veggies, and of course bannock and hand them out to lines of homeless that sometimes stretch around three city blocks! She does this to reclaim the Village Indigenous Peoples once had before the harmful effects of colonialism; she does it to build community relations. What many do not know, however, is that Althea herself suffered a bout of homelessness in 2011 after she and her five children were flooded out of their home in Ochre River after the province of Manitoba built a levee in an effort to prevent the flooding of the city of Winnipeg. The levee caused water levels to rise in the Dauphin Lake region. Left homeless in the aftermath of the flood, Althea’s family petitioned the provincial government and various emergency service providers for housing but were left out in the cold—they were all homeless. These agencies, it seems, did not have adequate emergency plans in place to deal with such an immediate crisis, and the different crisis agencies did not communicate effectively with one another. Moreover, the service providers Althea communicated with were, according to her, racist and placed her case at the bottom of a long list of priorities. Guiboche was then passed around like a hot potato, from bureaucracy to bureaucracy while her family’s homelessness worsened. The dual combo of flooding and bureaucratic obstacles, then, caused her homelessness, as it has with many Indigenous Peoples who’ve also tried to access unprepared services after major environmental disasters. Althea’s unique kind of homelessness, sadly, has affected vast swaths of Indigenous Peoples across Canada—from the repeated floods of the James Bay lowlands, to the 2017 summer fires of BC and the 2016 inferno of Fort McMurray in northern Alberta, to the rising sea levels in the North. The “system,” it seems, is not built, or is unwilling, to house large populations of displaced Indigenous Peoples in crisis situations. 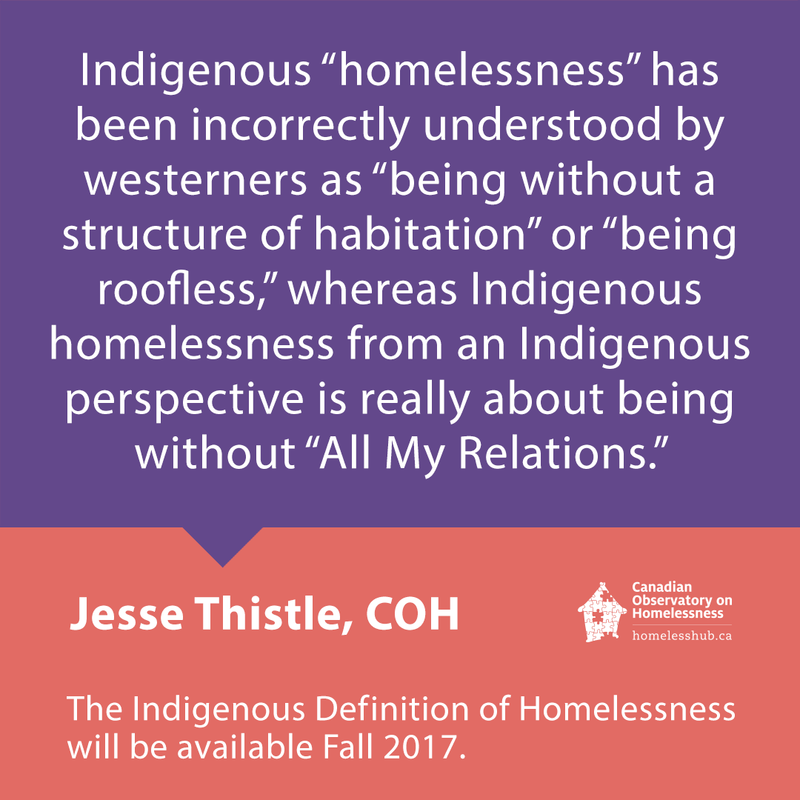 The above three examples of homelessness are specific to Indigenous Peoples in that they fall outside the scale of unhoused homelessness as defined by the COH’s Canadian definition of homelessness. Rose endured cultural homelessness since youth, Joe was spiritually homelessness after being separated from Creator through abuse, and Althea suffered emergency crisis homelessness caused by bureaucratic confusion and internal racism latent in emergency service providers. These examples, and many more like them, have appeared again and again in the work I’ve done with First Nations, Metis, and Inuit communities over the past 22 months of consultation in building the National Definition of Indigenous Homelessness in Canada for the COH. In many ways, my own understanding of homeless has broadened after hearing them. I am now convinced that from an Indigenous perspective, Indigenous homelessness is not about not having a structure to live in; it runs much deeper than that—it’s about not having healthy social, physical, spiritual, and emotional relationships. It’s about not having one’s indigeneity. And these relationships—known in the Anishinabek worldviews as All My Relations—have been eroded and/or destroyed by processes of colonization since Euro-style settlement began on Turtle Island in the 1600s. But I reveal too much, too soon, and for some, it will be a total “game changer” in the way that we think, look at, and treat, not only Indigenous homelessness, but also how we understand elder homelessness, youth homelessness, veteran’s homelessness, and homelessness in general. It will, from the little feedback I’ve received thus far, reframe the discussion of homelessness itself. If you are interested in knowing more, please join me at the CAEH conference in Winnipeg on Thursday October 26, 2017 where I, along with the COH, will launch the new Definition of Indigenous Homelessness in Canada during my keynote address. One last thought before I go, please know that the information I’ve shared with you here comes, not for me, but directly from Indigenous Peoples themselves—they’ve always known the kinds of homelessness they’ve had to endure, I simply asked them what they believed Indigenous Homelessness to be, and they told me. Homeward Trust Edmonton, Blue Quills First Nations College, & IRM Research and Evaluation. (2015). Research on the Intergenerational Impact of Colonialism: Aboriginal Homelessness in Edmonton – Towards a Deeper Understanding of the Indigenous Experience of Urban Homelessness. Edmonton: Homeward Trust.